Church History: A small group of Methodists in Clayton originally met in member’s cottages. The rural village of Clayton before the 1939/45 War consisted of Clayton Hall, Clayton Lodge, the village School, four farms, a village Green and a number of cottages, although development had started in Northwood Lane. 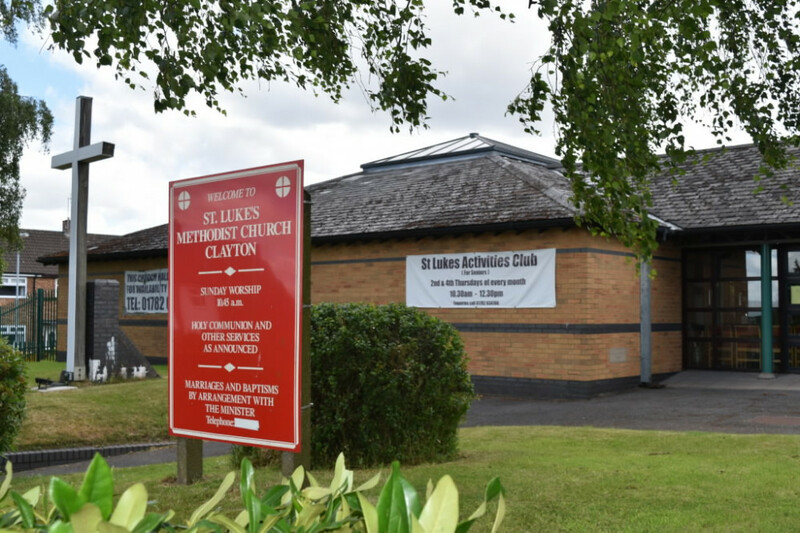 In 1946 Methodist Services of Worship were being held in the Clayton Community Centre (a hut) and soon after the use of the village School was granted for Sunday Services. The Society eventually obtained full use of an ex-Admiralty hut in Northwood Lane where Services of Worship and other social activities took place. There was no water supply or other services; however, these days were remembered with warm affection. On Saturday 21st May 1960 the Mayor of Newcastle and the Chairman of the District opened a multi-purpose building in Severn Drive. It was set in the midst of a new housing estate to cater for a growing population. This served the Methodist cause well for the best part of a quarter of a century. The first mention of a proposal to erect a new dedicated Church building appears in the minutes of the Church Council held in October 1984. The following year a Development Fund was started and early in 1987 Architects were engaged. Building work began on 23rd May 1989. Work proceeded apace during the summer and the autumn and the Opening Ceremony and Dedication Service took place on 9th December 1989. The two buildings, the new Church and the old multi-purpose Hall, were distinct and separate. Consequently work began, almost immediately to create a link between the two buildings. Architects were appointed in May 1990 and building commenced in January 1991. The Opening and Dedication of the Link took place on 11th May 1991. The buildings as we know them today were thus complete. Car Park: Parking for approximately 30 cars. Worship Area: Connected to church by link area. 2 lecterns and table on raised area. Table (moveable) and Holy Communion Rail (moveable). Premises: 3 smaller rooms and kitchen and hall with stage. Numbers Attending Worship: 25-30 average, generally 60-90 age bracket. Music & Liturgy: Worship book, Hymns and Psalms and Songs of Fellowship, Electronic Keyboard and Electronic Organ. Children & Young People: None at present.